I favor small red/yellow peppers for this. Four of these on a plate and you have a light lunch or supper. (Two would be good as a starter–on a small bed of rocket (arugula). 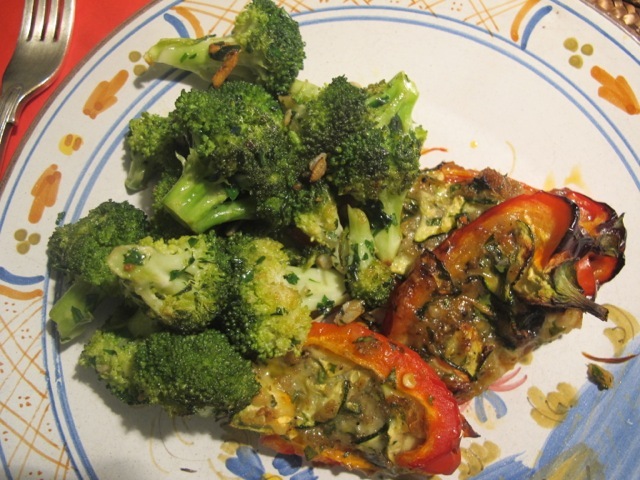 We added some simple broccoli with garlic to the plate last night. 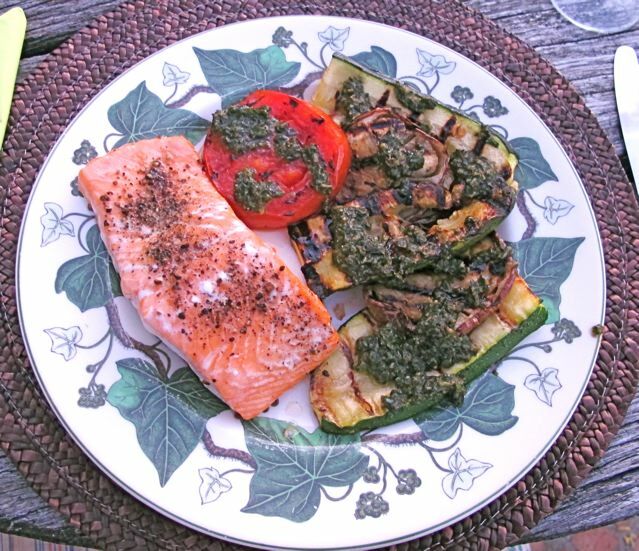 This is adapted from a Marcella Hazan recipe. Peel the peppers carefully with a hand peeler (easier than expected); halve them and then halve them again to form cargo carrying boats. 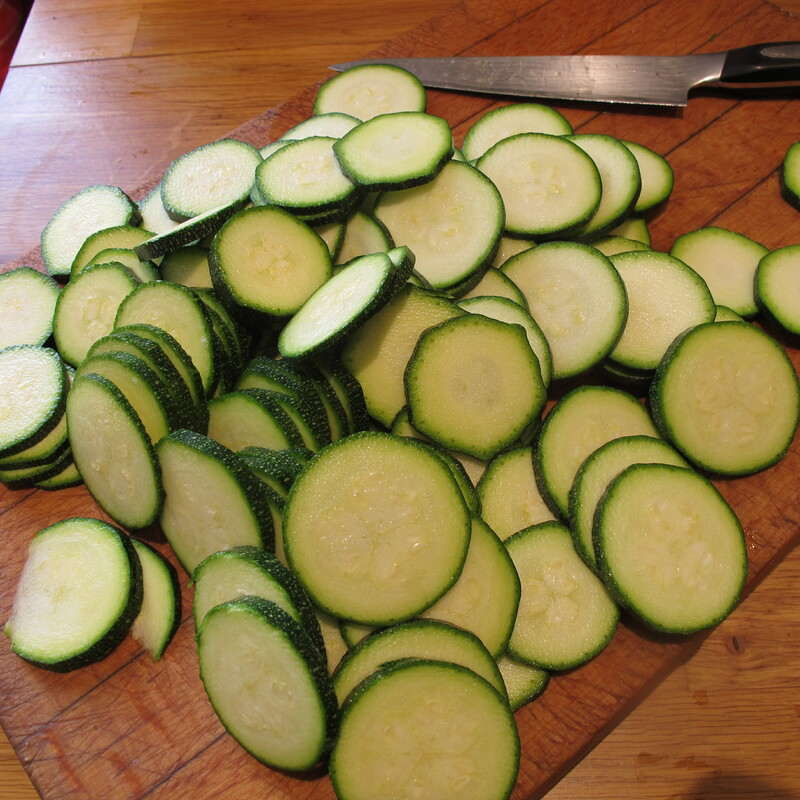 Slice the courgettes as thinly as you can. In a large bowl mix the courgettes, cheese, parsley, garlic and breadcrumbs with two tablespoons of the olive oil and season to taste. 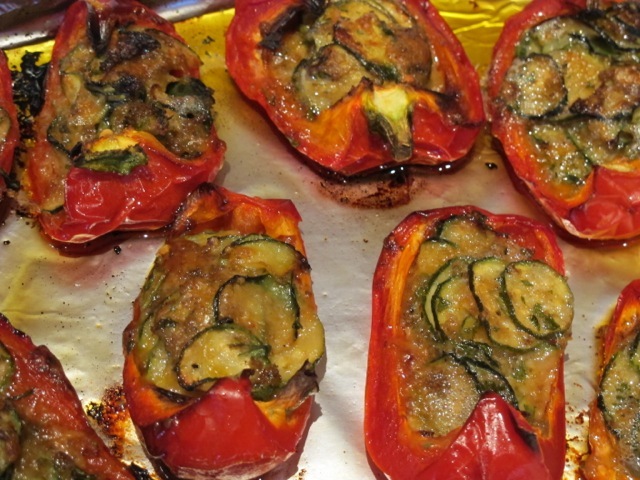 Load the pepper boats generously with the courgette cargo. Oil a piece of foil on an oven tray and moor the boats on it. “How apt” Meredith says ” …these boats being so “moorish”! 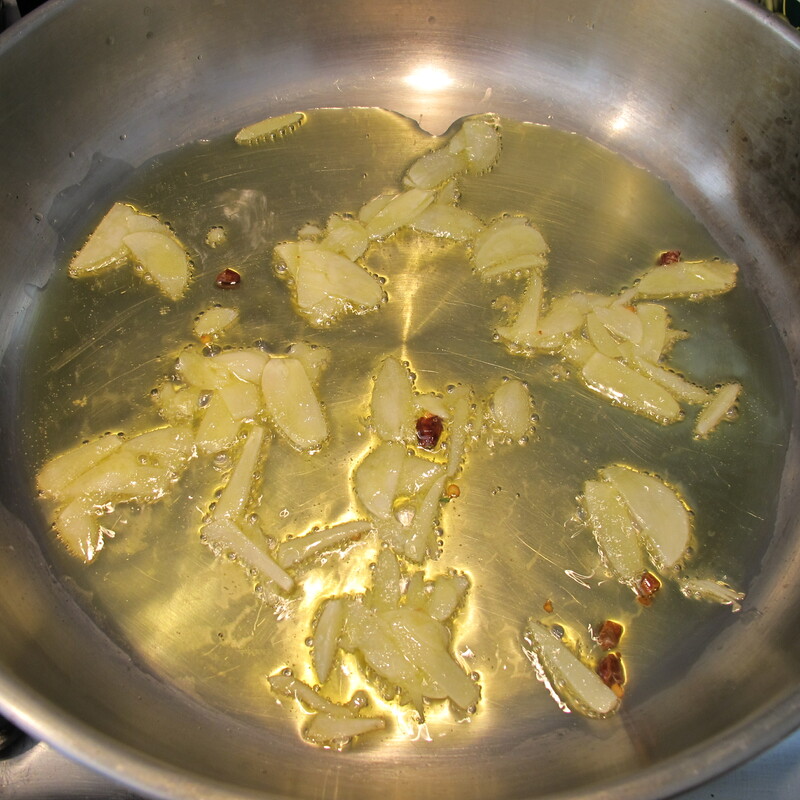 Sprinkle over the fourth tablespoon of oil. Thirty minutes in the top half of the oven should do it. 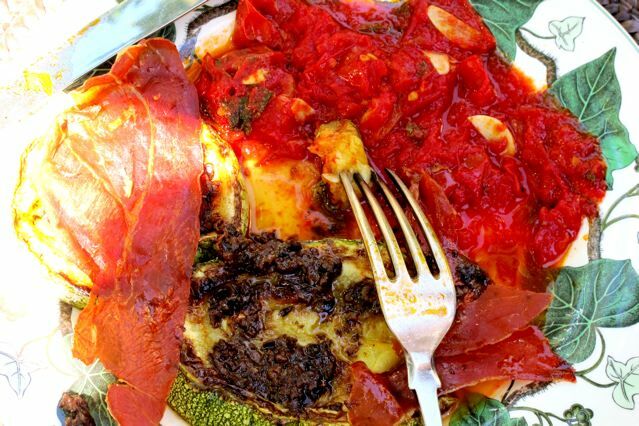 Three medium courgettes from the single plant in the garden and five eggs made up this handy end-of-season dish adapted from Carluccio’s Vegetable book. 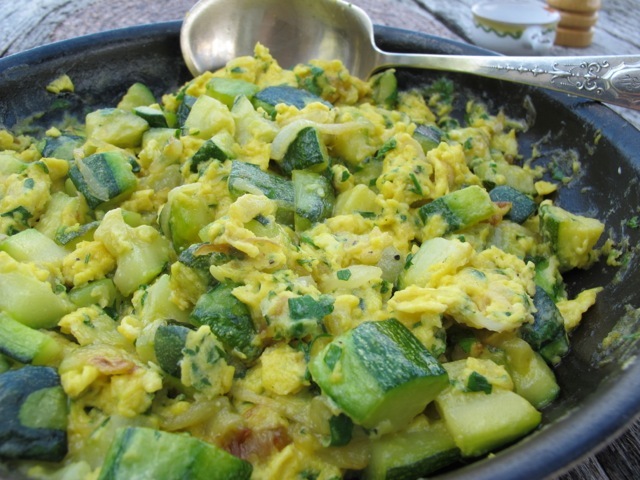 More scrambled eggs than omelette or frittata–it an attractive way to use some of the courgettes queueing up to be used as the glut develops. 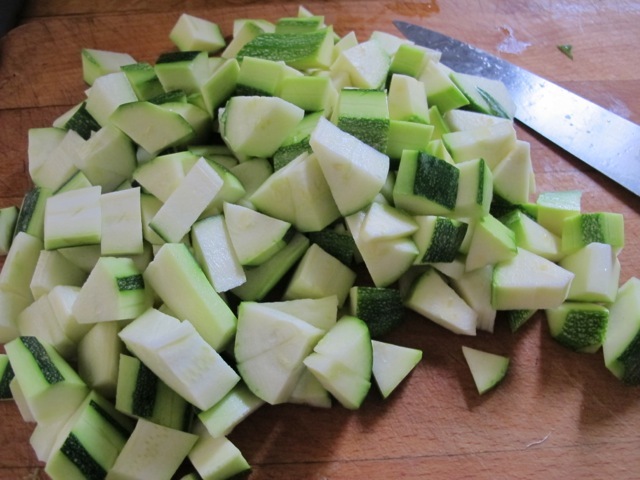 To prepare the courgettes–peel them in stripes, quarter them lengthwise and cut them in dice. Sprinkle with salt and leave them to drain in a sieve or colander for an hour or so. Dry them in kitchen paper or a tea towel. 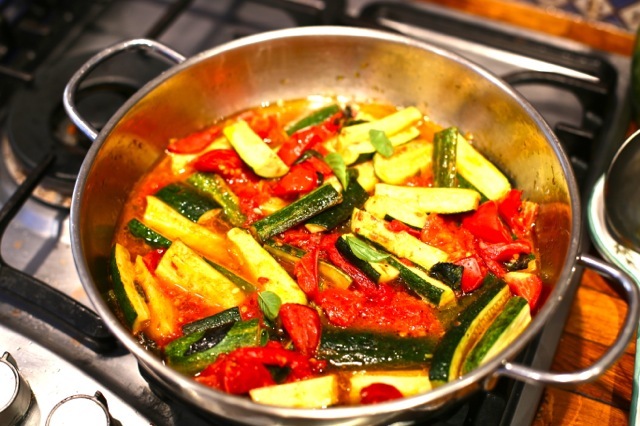 Heat the oil in a pan big enough to hold all the courgettes in a single layer. 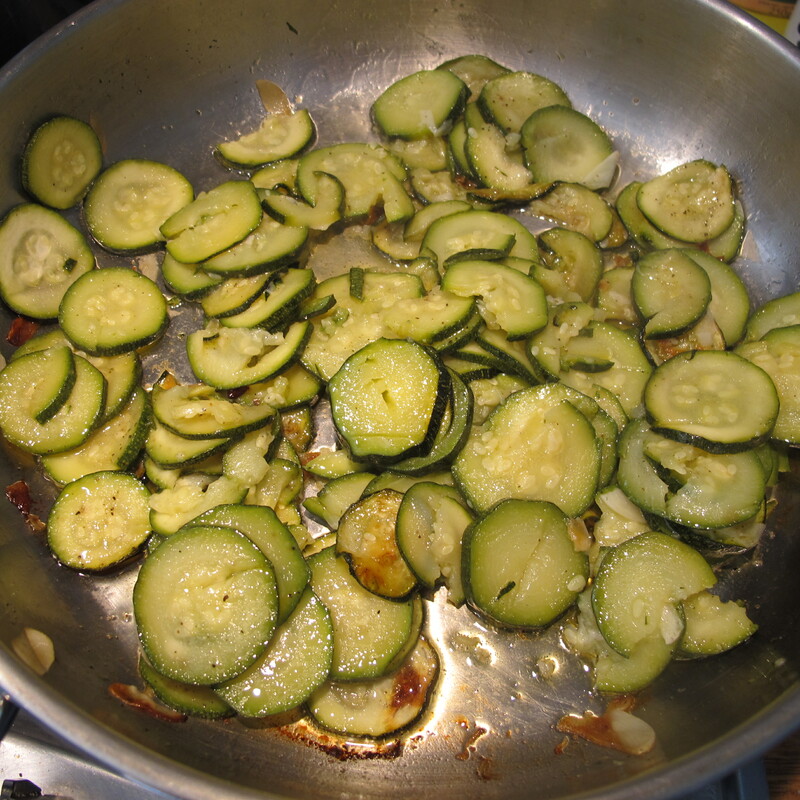 Sauté the onion over a low heat until it softens and then add the courgettes, turning them over in the oil. Cook them until they are tender–about 20 minutes. Break the eggs into a mixing bowl and whisk them together. 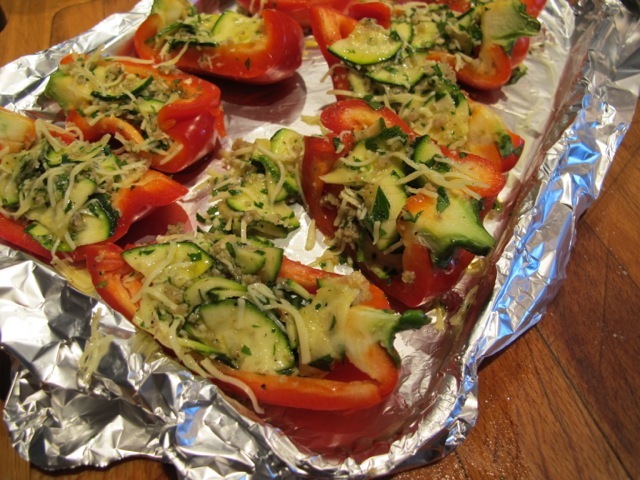 Mix in the parmesan, the parsley and mint (if using), season with salt and pepper–more pepper than salt, bearing in mind the courgettes have been salted already. 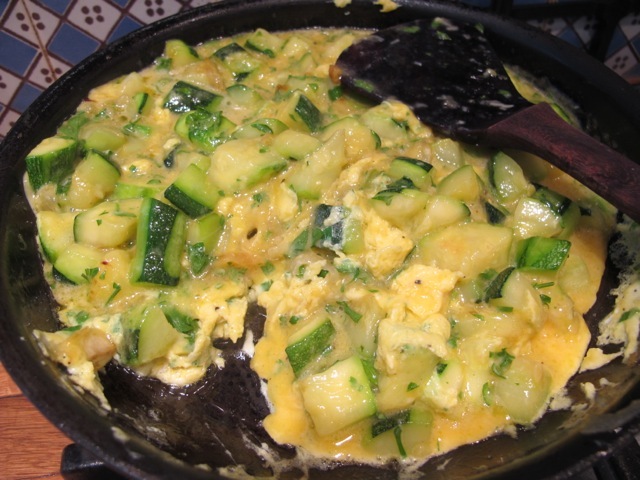 Pour the egg mix over the courgettes and start turning it over gently as the eggs solidify. 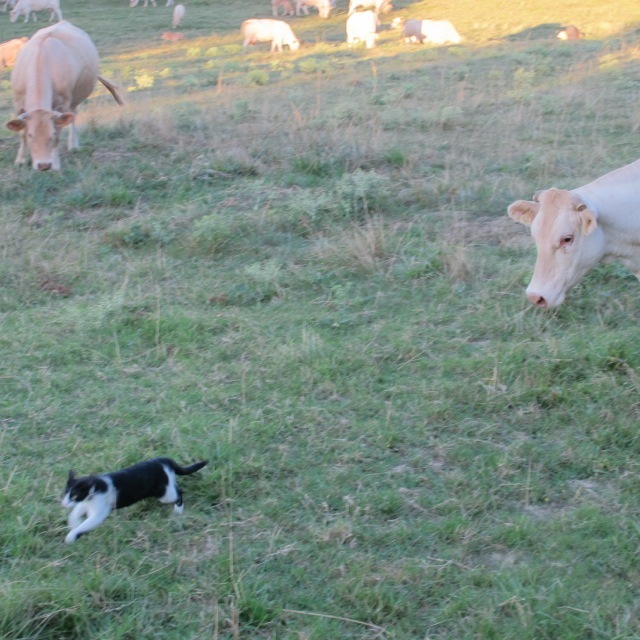 This will not take long–it’s ready when the the mix is loosely solid–scambled in fact! Take care not to cook it too solid! 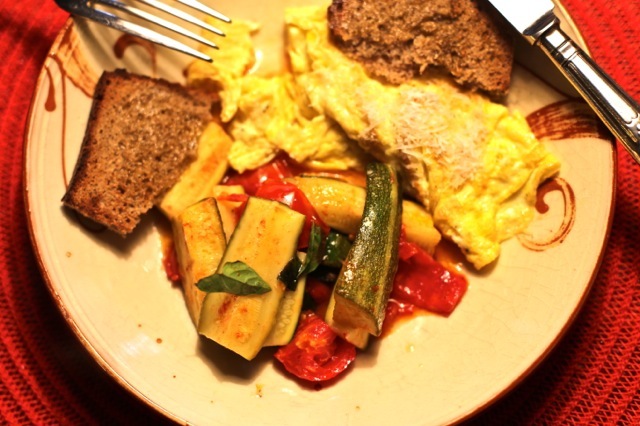 Meredith toasted two pieces of wholewheat bread and sprinkled some olive oil over them to eat with these courgette “eggs”. Just back from an unexpectedly extended London visit–thanks to a strike by air traffic controllers in France. In fact the extra days (4) were a blessing. 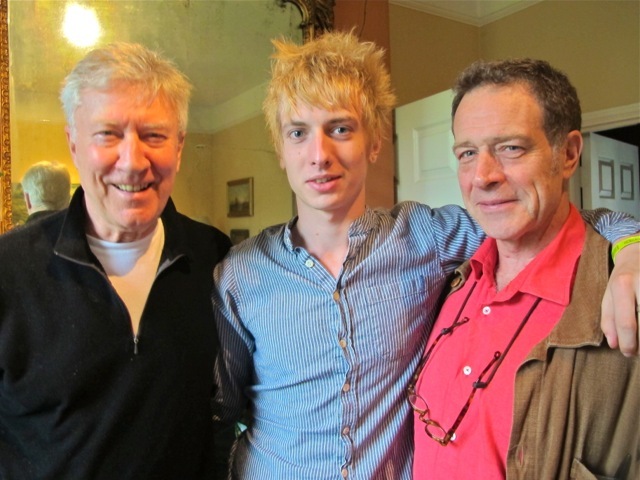 A chance to catch up with brother Jack who flew in from Japan the day before we were supposed to leave and nephew Theo, who plays bass guitar in Wolf Alice–burgeoning indy band about to hit the big time. Brothers as the backing group to the new kid on the block! 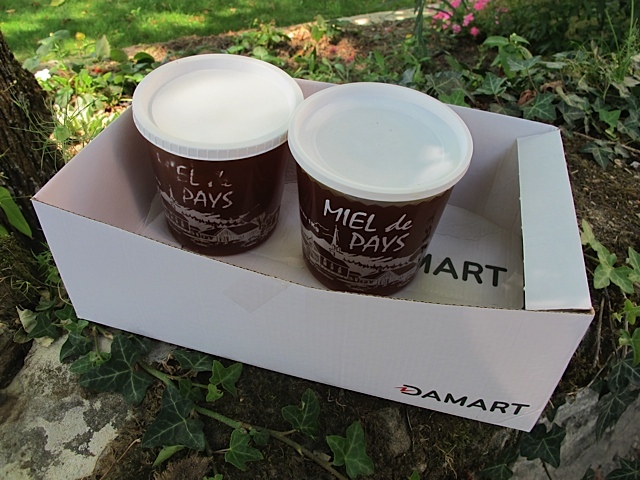 Now back in France and a stew with SUMMER in its DNA–though the seasonal sweetness of fresh tomatoes may not yet be fully expressed–and enough comfort factor to lift the spirits after a wet and wretched May here–not to mention the tempest raging outside today! It’s inspired by a Martha Rose Shulman recipe in The New York Times. 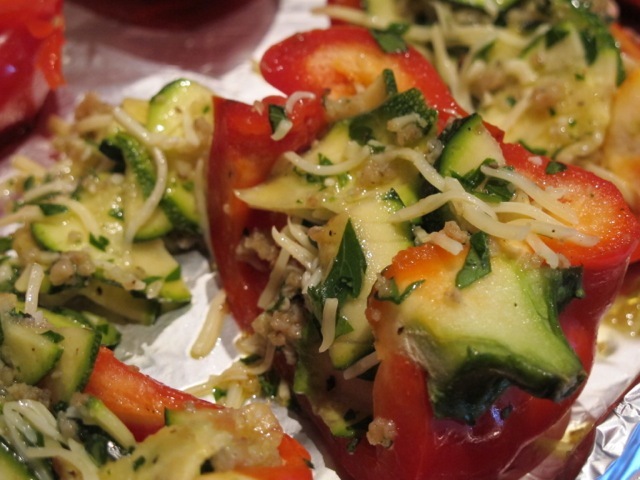 Few ingredients, simple to do and a pleasing look–just the ticket! 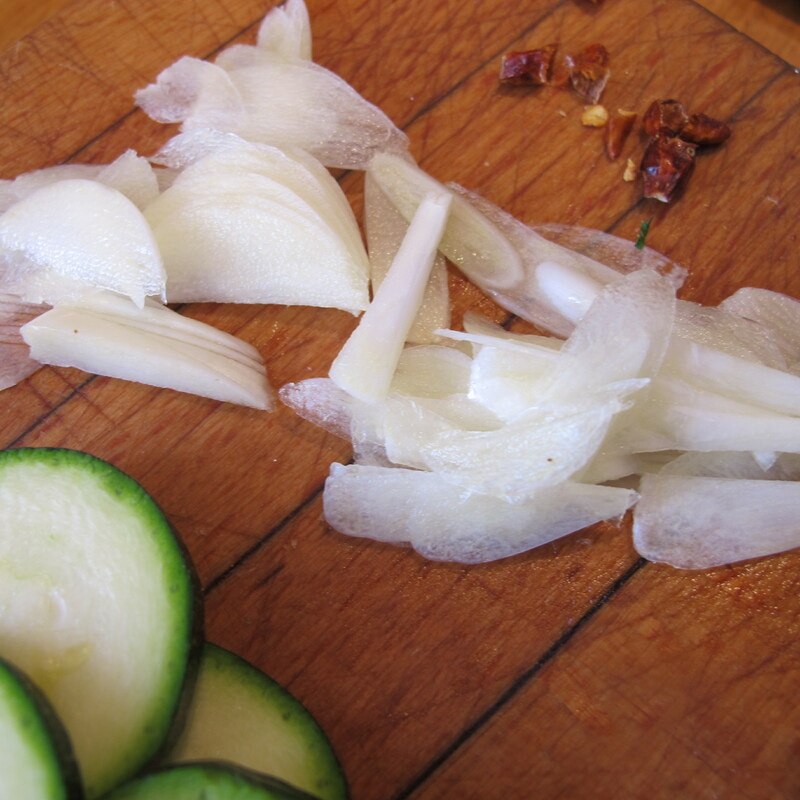 Sweat the onion in the oil until soft; then tip in the garlic and sauté for a few seconds. 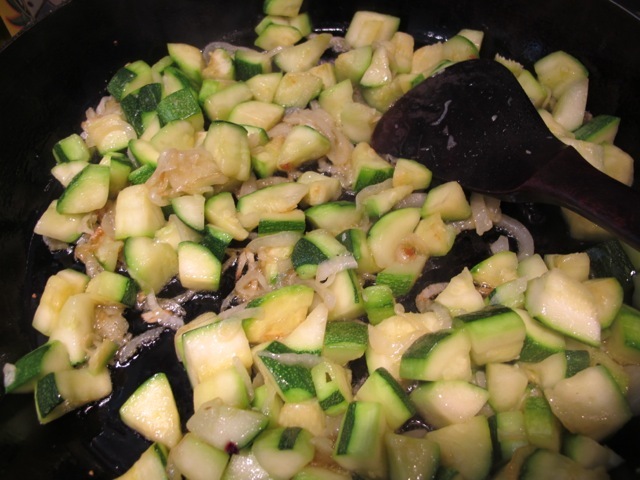 Add the courgettes/zucchini and turn them over in the mix. Cook until they too start to soften–about 5 minutes. Add all the tomatoes, thyme sprigs and a seasoning of salt and pepper and cook for 10 minutes until the cherry tomatoes start to soften. Add the beans and their liquid and/or a couple of tablespoons of water. Check the seasoning for salt and pepper. We are having the stew spooned over a baked sweet potato tonight. 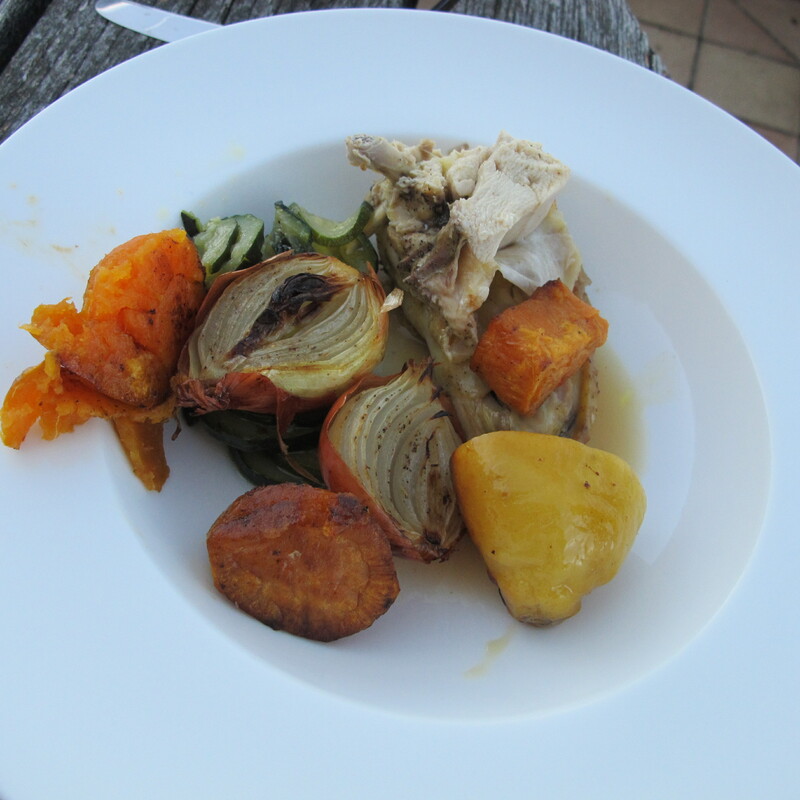 Dinner for four/six–though we were three! and the harvesters were hard at it in the field beyond the road. Just the three of us–our friend Romaine came back with us from London. The chicken she and Meredith bought would serve six and there were more onions and an extra sweet potato in the basket for unexpected guests. 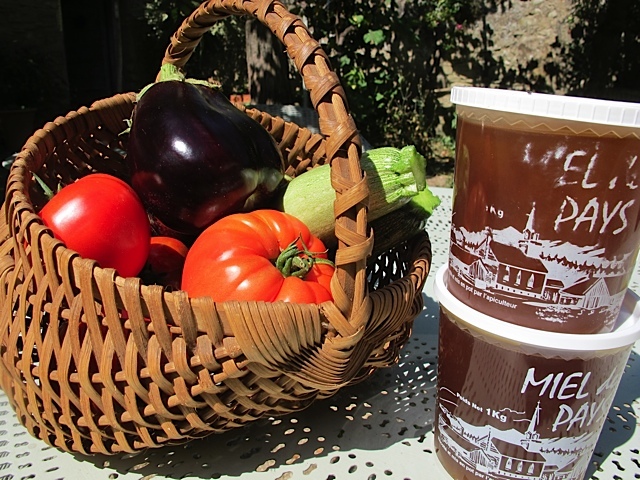 The kilo of courgettes–slow cooked and melting–would easily stretch to six. Happy to be home–we tucked in. 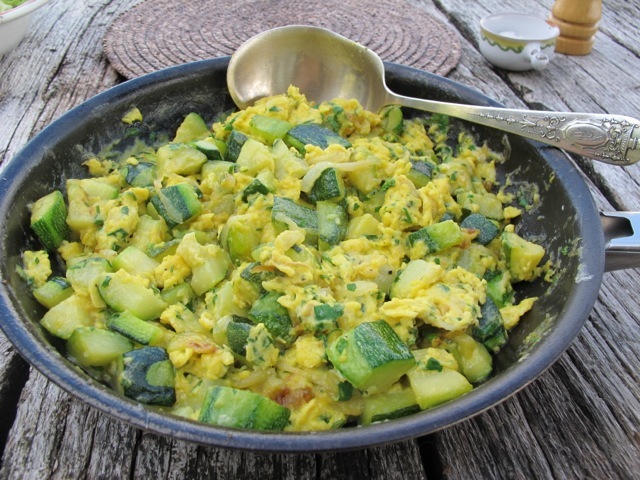 The courgettes/zucchini recipe is from Skye Gyngell’s version in her book How I Cook. It is cooked slow and is mushily delicious with a little kick from the chili. 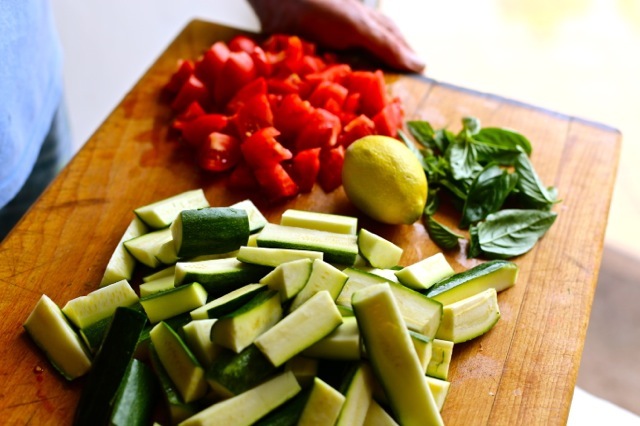 Slow cooked courgettes/zucchini with garlic and mint. 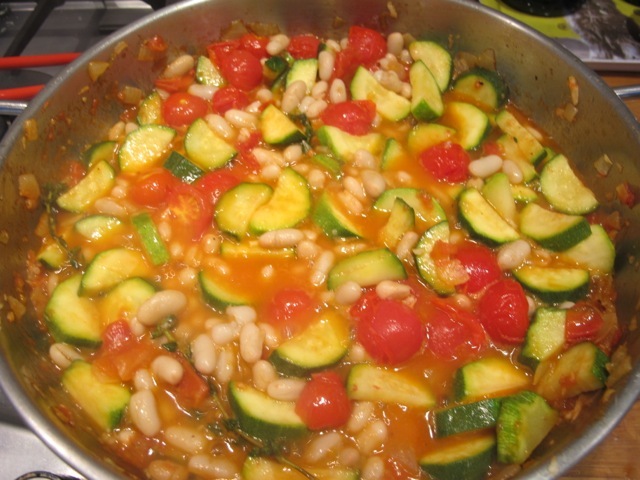 I made it again today with a pound (500 grams) of the courgettes and we enjoyed it tepid as a salad. Regime change [part 2]–a timely visit. Our friend, Sonia, called by with husband John yesterday to buy an extra cook book autographed for a friend. She’s a green-fingered gardener and a generous spirit–seldom arriving without something seasonal from her vegetable patch. 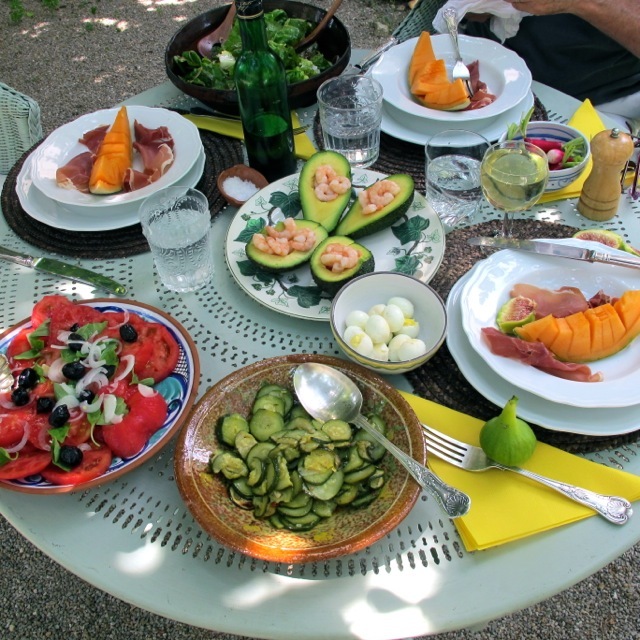 Yesterday she brought us two HUGE tomatoes, and a round courgette. How on earth did she know about our new resolve!? No wine! We kept the pledge--but it was hard. 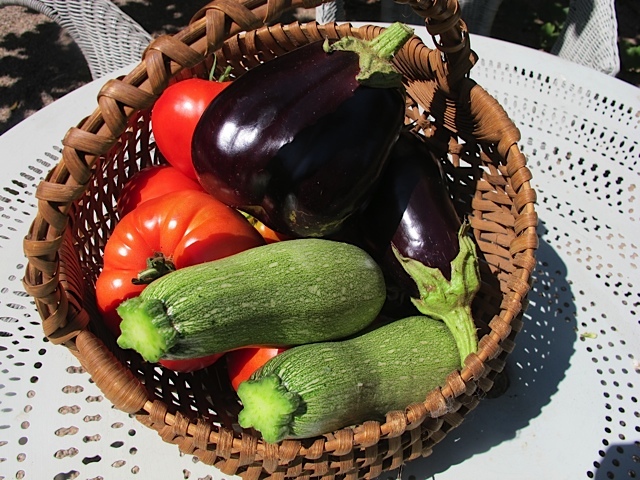 Now–what to do with the two red beauties…? One weighed in at a pound and a half (700 grams)! A sauce, perhaps…? A sliced tomato salad and pesto again, with the other (a puny pound or 450gms)? Some of the left-over Parma ham, lightly grilled, and Sonia’s courgette–cut into thick rounds, lightly salted and left to drain for half an hour, dried and brushed with olive oil, then roasted for 20 minutes at a high heat (turn them over after 10 minutes) with a spoonful of tapinade spread over it this time–will see us through to supper. 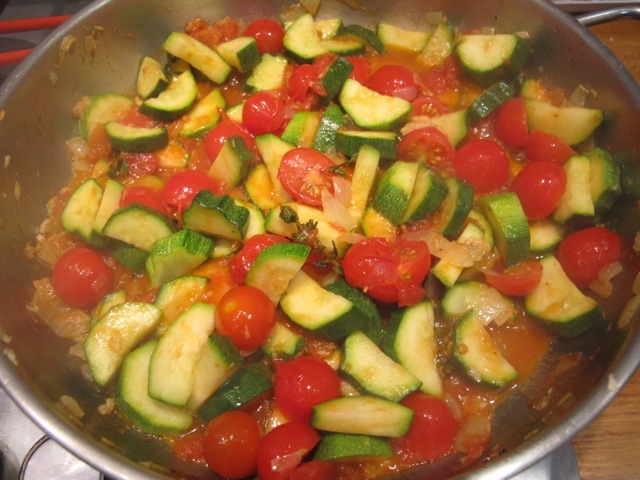 Post lunch, I notice that there’s enough tomato sauce left over to make a small courgette tian for supper. We’ll be not be wanting courgettes for a couple of days! 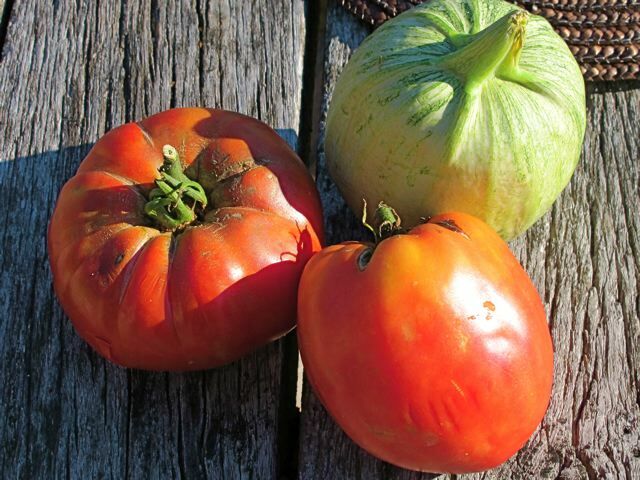 But there are plenty of other summer choices and I’ll never tire of red ripe tomatoes….must go check the tomato patch!